We need to stop looking at poverty as a separate phenomenon from the rest of the economy—an economy with a proliferation of low-wage jobs and a weak and inequitable recovery. Yesterday, the US Census Bureau released its annual data on income, poverty and health insurance coverage. This kicks off the one week every year when we can absolutely count on a veritable frenzy of stories and headlines about poverty. The other fifty-one weeks? Not so much. Nevertheless, there were definitely some great materials released by antipoverty advocates and experts yesterday that deserve attention. Below is just a small sample. While the headlines will read that the poverty rate held steady, the most important takeaways for me from the new data are these: we need to stop looking at poverty as a separate phenomenon from the rest of the economy—an economy with a proliferation of low-wage jobs and a weak and inequitable recovery; and we especially need to stop viewing those who live in poverty as suffering from some sort of character flaw, as opposed to paying the heaviest price for our skewed priorities and choices. Finally, a quick glance at the numbers emphasizes just how easily poverty could grow significantly worse with some of the cuts to the safety net that are currently being proposed. Poverty remained flat: 46.2 million people—15 percent of the population—lived on less than $23,021 annually for a family of four. Child poverty remained flat: 16.1 million children—22 percent of all children—lived in poverty, including over 37 percent of African-American children. Children under age 5 in poverty: Over 5 million—25 percent of all children under age 5—including over 42 percent of African-American children, and 36 percent of Latino children in that age group. People who would have been in poverty if not for Social Security: 67.6 million (program kept 21.4 million people out of poverty). 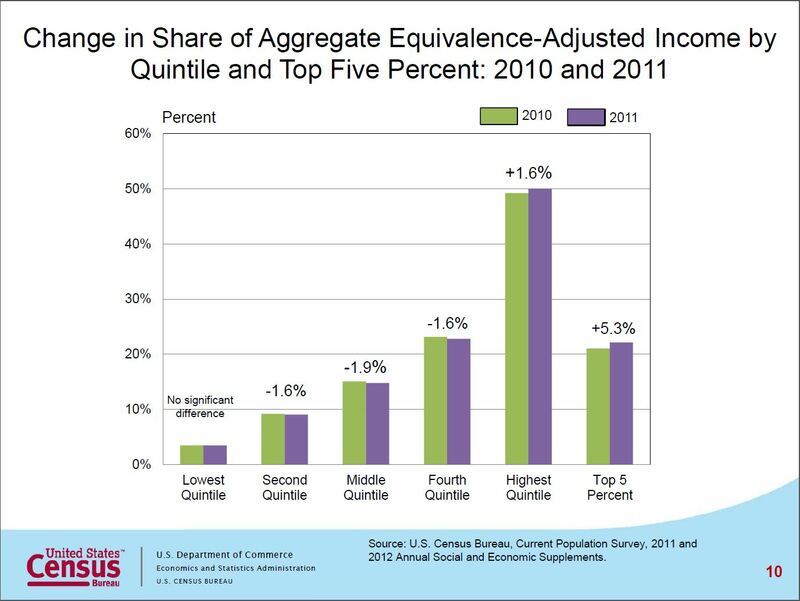 Income inequality: Incomes fell for the bottom four-fifths of US households, rising only for the top one-fifth. Income quintile with largest growth in number of full-time, year-round workers: bottom 20 percent, with a 17.3 percent increase in FTYR workers. Unemployment insurance (UI) income: fell by $36 billion (25 percent), due in part to benefits declining as Recovery Act provisions expired. Unemployment insurance, 2010: lifted 3.2 million people out of poverty. Unemployment insurance, 2011: lifted 2.3 million people out of poverty. Number and percentage of uninsured Americans: fell by 1.3 million, from 16.3 percent to 15.7 percent, largest annual improvement since 1999; 40 percent of that decline is attributable to persons ages 19–25, as a result of Affordable Care Act allowing individuals to remain on their parents’ policies until age 26. Earned Income Tax Credit: would have lifted 5.7 million people—including 3.1 million children—out of poverty if counted in the poverty measure, bringing poverty rate under 13.2 percent. SNAP (food stamps): would have lifted 3.9 million people—including 1.7 million children—out of poverty if counted in the poverty measure, bringing poverty rate down to 13.7 percent. You can e-mail me at WeekInPoverty@me.com and follow me on Twitter.